Post a position on a Roadtechs.com Job Board, and interested workers will e-mail their resumes to you. This way you attract AVAILABLE personnel, and not waste your firm's valuable resources running down personnel that cannot or are otherwise uninterested in accepting your current offer. For 20 years this model has worked successfully for Roadtechs.com and our over 400 firms who use Roadtechs.com to fill their contracts. This model results in recruiting firms being able to fill contracts in a much more timely and cost efficient manner. Simply said: Post your jobs, and the Roadtechs traffic responds to your postings. Our workers trust Roadtechs, and over the years we have accumulated the niche technical traffic to support our model. See the flowchart at the bottom of this page for a visual. Roadtechs.com is much more cost effective than the competition. We're easy to use, simple to navigate. Jobs can be posted in seconds, replies and resumes start coming in moments later. Our fast and easy search tool helps users find the right job quickly. Job Postings - Posting your available jobs is the first step in getting your firms staffing needs directly in front of our technical and skilled trades work force. Well over 15,000 workers a day have been coming to Roadtechs since 1997 to find their next job. But your posting doesn't just sit there; the Roadtechs website will then automatically perform other actions automatically to help further extend the reach of your job, such as automated Black Book resume searches, and automated selection of your postings into our HotSheets and RSS Feeds. (details shown below). Roadtechs will also perform other proprietary functions to ensure that maximum reach and exposure for your job posting in from of the right personnel. 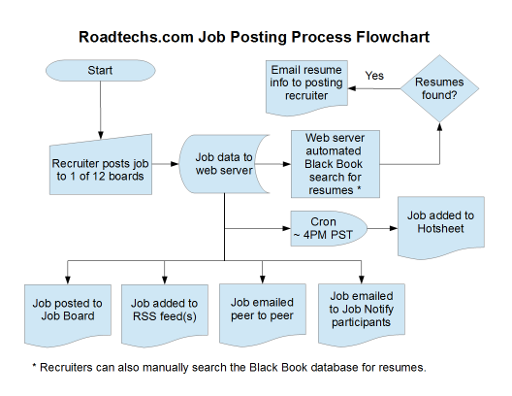 Black Book Resumes emailed to you - When you post a job on Roadtechs.com (using the Job Title drop-down in the form and an email address for replies), a Black Book resume database search will automatically be performed. Any job seeker resumes matching your job title and industry will be emailed to you for review (email is limited to 20 resumes) within moments of posting your job. The email will not contain any contact info, you have to log into Black Book to see contact details. Announce! - The Black Book Announce! feature will allow job seekers to immediately broadcast their availability to recruiters seeking those worker's specific skill sets. For recruiters, this feature is activated by simply using a single, valid email address and the Job Title drop-down field in the job posting forms. Announce! List - This is a list of profiles for job seekers that are AVAILABLE NOW! These folks have taken the time to announce their availability and if you need these skill sets, it couldn't be easier. Just review the list (often) and review those profiles that meet your needs. A recruiter Black Book account is required to review contact information on profiles. Job Notify - The Black Book Job Notify feature will allow job seekers to receive immediate notification of jobs matching their selected skill sets. For recruiters, this feature is activated by simply using the Job Title drop-down field in the job posting forms. Hotsheets - The jobs you post on Roadtechs.com, based on discipline, are sent to job seekers via an email list called "Hotsheets" once a day, after 4PM Pacific time. This feature is provided to our client shops posting jobs at no additional cost. Hotsheets contain all jobs posted for the selected discipline in the previous 24 hours. If no jobs were posted for the selected discipline in the previous 24 hours, then no HotSheet will be published for that day. This is another way that Roadtechs.com gets your job postings in front of the job seekers. RSS feeds - The jobs you post will be included in our RSS feeds, for those workers that want their job posting updates on a more real-time basis. We have RSS feeds for all 12 boards and a good selection of disciplines. The feeds are filtered for discipline so the information is getting to the exact worker you're looking for. This is another feature provided to our client shops posting jobs at no additional cost. Client Shop Listings - Every Roadtechs.com industry area has an associated listing of client shops. Your shop can be listed in areas where you have purchased an annual job posting package. A client shop listing on Roadtechs.com will allow job seekers to contact you directly, send resumes, etc. Some shops rely on their shops listings to build their resume files. Client shop listings are included with an annual job posting subscription. Peer to Peer Network - Roadtechs.com job seekers can easily forward your job posts to other job seekers via email increasing the reach of your job postings. Black Book Resume Database - A Roadtechs.com 1 Year Black Book Resume Database Access Registration provides your recruiters UNLIMITED**** resume access for a low flat rate. This is Black Book database access only, no job postings are included with this account. Black Book accounts are purchased for individual recruiters and account sharing is not permitted. The minimum number of accounts you can purchase is 5. Black Book access can be purchased at a reduced rate when combined with an annual or quarterly unlimited job posting registration. A Black Book Resume Database account is required to view job seeker contact information listed in emails generated from job postings or when job seekers announce their availability. Billable (On-Demand) Recruiter - Do you have a recruiter skill set that is in high demand? There may be businesses looking for those skills and are willing to pay for your valuable professional services. Or, perhaps you have extra time to devote to another recruiting job at an hourly rate? Some businesses or projects require more recruiters for a short amount of time. There are also occasions where a firm needs a recruiter with a specific skill set (i.e., Federal Government contracts experience) in order to execute a contract. A Billable Recruiter listing on Roadtechs.com will place your information in front of the very firms that need your experience and expertise. Your name will be listed in our Billable Recruiter index and linked from that index to your recruiter page. The recruiter page can include your qualifications, contact information, experience, bill rates, etc. Basically, you can advertise yourself and provide prospective client firms with all of the information they need to make a decision to bring you on board. Banner Ad Packages - Banner Advertising is a great way to get attention and promote your company, a product or service. A banner ad also lends permanence or stability to your business. You get a banner ad (468 pixels wide x 60 pixels high) displayed 24/7/365 in any or all of the 12 Roadtechs areas, co-mingled within the job postings. You also get a block ad (141 pixels wide x 118 pixels high) displayed 24/7/365 in any or all of the 12 Roadtechs areas and the Roadtechs.com index (main or landing) page. Targeted Search Advertising - Targeted Search Advertising is a great way to get attention and promote your job openings. It's also puts your company information in front of the users with the skill sets you're looking for. It's a great way to build up your file of potential candidates as it encourages candidates to send their resumes directly to you. https://www.roadtechs.com/search/search.php?search3=t1080&area=fa01 Click this link to see how the search results and targeted ads look (will open in a new tab of your browser). HotSheet Advertising - Roadtechs HotSheet advertising is a method of displaying your company information, job openings, or a link to apply for your positions at the top of a HotSheet for a particular job (discipline, trade) HotSheet that you have selected. When a subscriber receives a HotSheet for the trade / skill you have purchased, let's say "welder", then your company graphic and contact information is displayed near the top of the HotSheet. HotSheet Advertising is a great way to get attention and promote your job openings. It's also puts your company information in front of the job seekers with the skill sets you're looking for. It's a great way to build up your file of potential candidates as it encourages candidates to send their resumes directly to you. There are currently 37 Hot Sheets with over 4400 subscribers. We are seeing a subscription growth for HotSheets (overall) of about 2.5% per month. Some HotSheets are more popular than others, as indicated by the number of subscribers, so our prices for HotSheet ads are quoted based on the number of subscribers instead of a flat rate.